There was a time when being willing to eat anything got people a career at a carnival. And then there was a time when being willing to eat anything got a very special person a career in science. Fortunately, both those times are over. As a teenager Frederick Hoelzel was, concerned about his weight. He decided to lose weight, without being hungry, by eating nondigestible substances. Anything that passed through his system undigested got a regular spot on his plate. This included the parts of a plant that you aren't supposed to eat, like the cob of an ear of corn, or the stem of a banana. He also wolfed down fabrics, feathers, and even asbestos, but cotton balls were his favorite. Today, we would recognize this sort of thing as a disorder and get Hoelzel some help. In the 1920s, the great minds of science took a look at him and asked, "Hey, you wanna try eating this?" 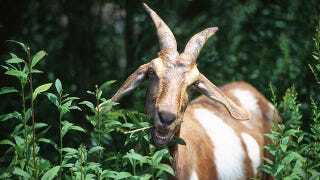 Hoelzel got the nickname "Human Billygoat," and received all kinds of strange food assignments. One was simply a 15-day fast that left him with visible ribs and knees that stood out from his shrunken legs. More often, he was asked to eat various things and record how they passed through his body. A sample chart of his culinary adventures records what he ate, how many pieces he ate, the objects' specific gravity, the percent of the material that was "recovered," and how long it took to pass through his system. Most actual food took about 25 hours. Carbon dioxide gas took two to six hours (no mention of the percentage recovered, which I think is a shame). Gold pellets weren't recovered until twenty-two days after they were eaten. Silver wire took about 80 hours. Gravel (directly from the lab driveway) took a little over 50 hours. String proved the quickest mover, emerging explosively after only about an hour. Amazingly, this did not do wonders for Hoelzel's career. He only made it as far as "assistant in physiology." He was a press darling, though, and the subject of many articles before his death in 1963. Top Image: Public Domain Images.